This section of our store does not sell, it shows you the different gifts that we have and have had for sending with amulets you buy from our store as a big thank you and in the hope that they bring you auspicious blessings and happiness. Due to constantly changing choice of amulets, You can’t choose which gift, rather must leave it to chance, and there are many gifts we don’t photograph and publish here, so these are just some of the gifts we have or have had in the past, and those which we will be giving in future too. This section began documentation in the end of December 2012, and will continue to publish pictures of the various gifts we have included in parcels to our valued customers. Please click on each image in the gallery to read the info about the Amulet, and the time and conditions which it was or is being given away. Many amulets we send as free gifts will be archived as gallery thumbnails here, and grow as we add with the passage of time. This will allow you to see the archive of past, present and future gifts which Thailand Amulets has is and will give to its Customers as part of our service. All Customers receive presents with all orders, always. These are just some of the special ones we announce for all to see, but there are many other amulets, yant cloths, oils and other things that Thailand Amulets give to all customers always with all orders, so don’t worry that You have to buy during those days to get a free gift, as You will always get free gifts from Thailand Amulets with every order. All Customers recieve free presents with all orders. 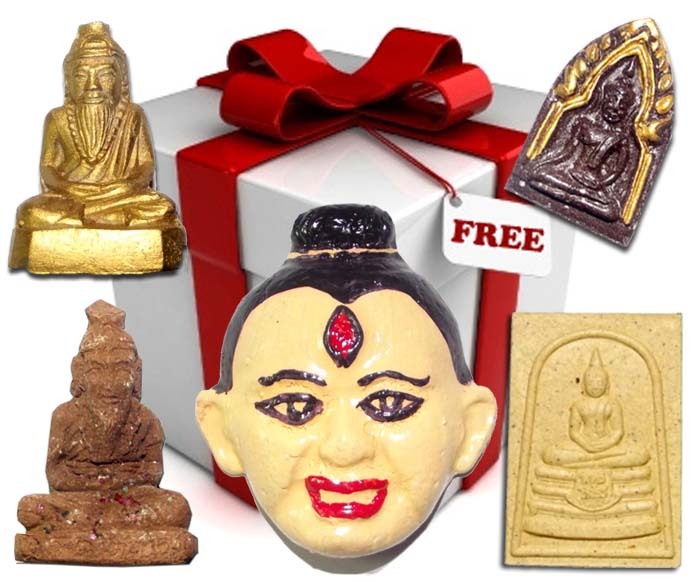 These are just some of the special ones we offer as bargains, but there are many other FREE amulets and yant cloths, oils and other things we give away free to all customers always with all orders, so dont worry that you have to buy more stuff to get a free gift, as you will always get free gifts from us with every order. We just wish to offer some quality gifts for your perusal and choosing, as a way of Giving You Extra Value Added Service.